I have made it a discipline that whenever I open a bank account or receive a credit card the first thing that I do is call the phone number provided and ask them to turn off any and all use of my information for sales. Companies are cagey and often have several different settings. If any one setting is left on, it will result in your information being used to market products to you. Taking my own advice, I called American Express to make sure that they would never market to me again. As a result of my call, I learned that they are even cagier than I thought. As cynical as I am, they still surprise me. During my automated phone call, I turned each of the seven off. They call them “choices” but their goal is to market to you as much as possible. The language they used to try to sway you to accept their market was a fascinating study in psychological manipulation. After the call, I decided to go online to copy American Express’ language to show this savvy marketing copy. If the box is unchecked, American Express will not call you to inform you of offers we believe you may be interested in. You will become eligible for marketing by phone again in five (5) years after your initial choice, or longer if required by applicable law, and can renew your choice at that time. If you are now or become enrolled in Account Management, your Account Manager will continue to contact you, including to discuss offers, unless you unenroll from Account Management through your Account Manager. If the box is unchecked, American Express will not contact you by mail to inform you of offers we believe you may be interested in. You will become eligible for marketing by mail again in three (3) years after your initial choice and can renew your choice at that time. Again you can turn being marketed by phone off, but they will turn it back on every 5 years and you will have to “renew” your choice or else they will start marketing to you again. If the box is unchecked, American Express will not contact you at the email address we have on file about offers we believe you may be interested in. This choice applies to all American Express accounts you currently have with this email address on file. If the box is unchecked, American Express will not send you merchant/partner offers, such as from our merchants that accept the Card. If the box is unchecked, American Express will not send you offers for sweepstakes and contests. However, you may still continue to receive communications about sweepstakes or contests that are already in progress. Choose how American Express may share your information within the American Express family of companies in certain cases. If you deselect the check box for any or all of the sharing, please note that we may still share your information while we process your request. At any time, if you would like to allow the type of Affiliate sharing described in this section, you may choose to check the box to agree electronically to revoke any previous choice and allow such sharing. If the box is unchecked, the American Express legal entity that issued your product will not share information about your personal creditworthiness, such as your credit history as shown on a consumer report, with other companies within the American Express family (Affiliates) for everyday business purposes. Please note that this choice will apply to all your accounts with that Affiliate. 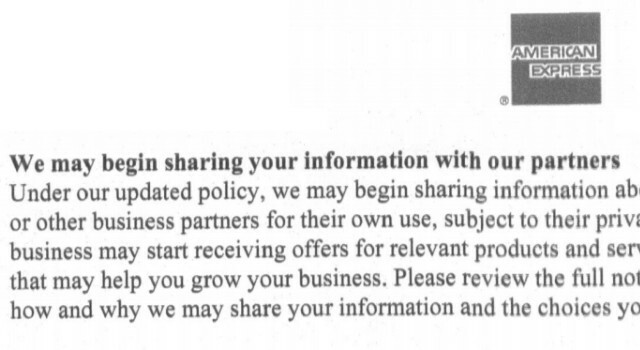 If this box is unchecked, American Express will not use your de-identified demographic data, transactions, and digital interactions with American Express to develop insights on consumer spending for Business Partners to use for targeted advertising. Your choice will be effective for five (5) years, at which time American Express will notify you to renew your choice. American Express will continue to protect, secure and use your data as set forth in our Online Privacy Statement. The descriptions used by American Express include the typical psychological manipulation of sales and marketing. You are meant to feel like you may be missing out on “hearing about offers that you might be interested in.” Overriding your previous wishes by turning marketing back on every 3 or 5 years is couched in terms of you becoming “eligible again” to receive such notices. You should be able to turn this off permanently, but American Express does not offer you this option. Some states extend the period for which you can opt out. Every state should. Consumer’s should be able to set their privacy once and have it effective permanently. You may have noticed that there were actually eight choices. The final eighth choice allows them to sell information about your purchase history to help companies learn how to better market to people like you. In my automated phone call, I was not given the opportunity to opt out of this choice. I had to turn this off online and was never told that it was set in the first place. Advertising doesn’t have to work every time for advertising to be valuable for the company. As a society, we are bombarded with up to 10,000 advertising messages every day. If we let just one per week encourage us to make an unneeded purchase, it can bust our budget and impoverish our future selves. Financial willpower is certainly a virtue, but it is wiser not to resort to using your willpower in the first place. We have a limited amount of willpower. It is a waste to have to expend it to ignore advertising. It is as wasteful as being on a diet and surrounding ourselves with nothing but donuts. Turn off as much advertising as possible and spend your willpower on financial planning which will enrich your life rather than just avoiding impoverishment. As much as possible, disallow companies to use your data in any way.